There will be a talk on the protector principle at 5pm on the first day of the mamo chants. 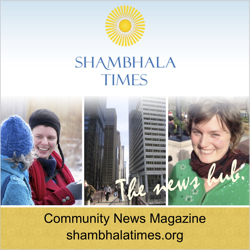 This year Shambhala Day is Tuesday, February 5th, marking the beginning of a new annual cycle. To dispel the karmic accumulation of personal, social, and environmental chaos at the year's end, all students are encouraged to practice as much as possible in the ten-day period leading up to Shambhala Day. In particular, we are encouraged to recite the mamo chants together, beginning eleven days before Shambhala Day. The mamo chant is an elaborate protector offering traditionally recited from the 20th through the 29th days of the last lunar month of the Tibetan year. By reciting the chant, we tune into the protector principle of awareness and reconnect with sacred outlook.